Go get a stack of beermats… got them? OK now split them into sets of four and put an X on every fourth one. Well done, you now own a copy of Skull and roses, possibly the easiest game on earth to play (this side of Knifey spooney) but no less good for that. 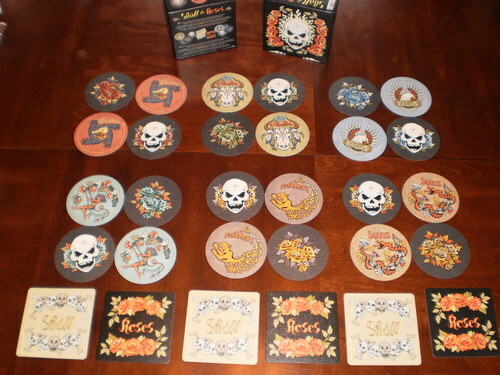 Skull and roses is the essence of poker.. with beermats. It’s a bluffing game and it never fails to entertain, usually with boisterous shouts. Conclave was no different. so when we got a game running a small crowd started to gather to shout encouragement and laugh at those who lost a round. I love Skull and Roses and I love introducing people to it. People pick it up after a round or two, it’s quick, it portable. Clean and Simple and a great filler especially with a good sized group.